Ricardo experts will present a free webinar on how operators of commercial road-vehicle fleets can develop effective business strategies to implement electric vehicle (EV) technology. The webinar will take place on Thursday 30 November at 10.00 – 11.00 GMT [09.00-10.00 CET]. The event will be hosted by Ricardo’s sustainable business and transport teams, and draws on their experience supporting some of Europe’s largest road-vehicle fleet operators to plan for electrification. Over the next decade EVs are projected to be one of the automotive world’s biggest growth sectors, presenting significant financial and operational opportunities for businesses. Meanwhile an increasingly stringent regulatory push to clean up road transport means that fleet operators will have to respond. However, for many businesses this will require a fundamental change in thinking. Not only will there be a transformative change to vehicles themselves, but businesses may need to provide charging points and take advantage of ‘smart’ charging regimes to avoid periods of high cost electricity and maximise the benefits from adopting EVs. These issues, and other aspects of the rapidly changing, and increasingly interlinked, transport and energy markets, make adopting EVs a sometimes confusing and challenging task for fleet operators. In the upcoming webinar, Ricardo will offer practical guidance on how businesses can overcome the short- and long-term challenges of electrification and get the most from the rapidly changing transport and energy landscape. Ricardo’s sustainable transport experts will review UK and other leading governments' visions for electric vehicles and provide real-world case studies on organisations that have developed electrified fleet strategies. 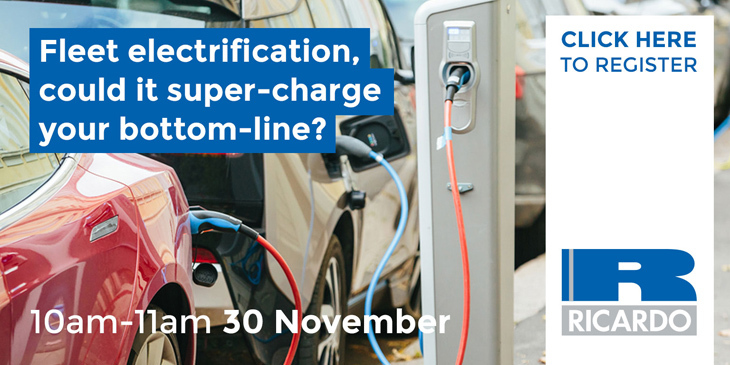 They will also offer insight into the process for calculating the benefits of fleet electrification and practicalities for adopting these vehicles - with a particular focus on cars and vans. Ricardo is uniquely positioned to provide support across the entire electric vehicle arena. Alongside its strategic services for businesses, Ricardo is supporting governments at European, national and local level to develop policies that work towards the global ambition of reducing the impact of vehicle emissions. Ricardo is also leading in the development of passenger cars with electrified powertrains. Its engineering teams are working with major automotive manufactures to develop electrified powertrain products that meet the environmental goals of regulation, and deliver long-term commercial sustainability.